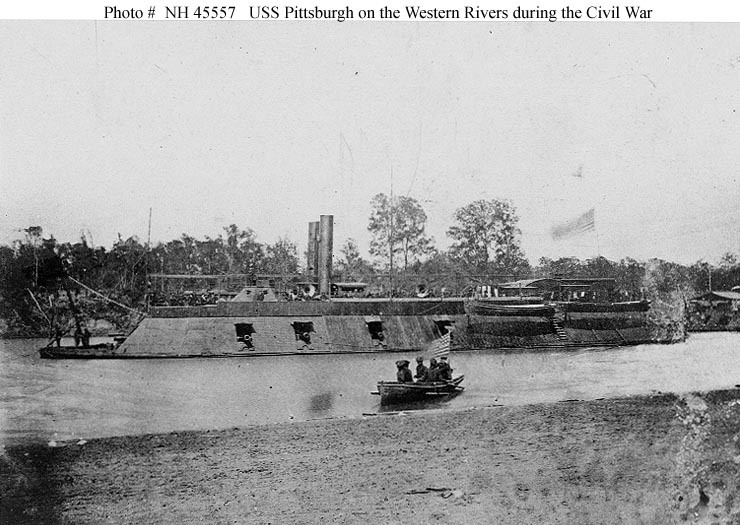 Several of these photos identify the ships as being on Red River during 1864. Others are photos that probably are ships on the Red at that time but are not so identified. By examining the background, foreground and other details, some of these photographs certainly were taken in the same area. 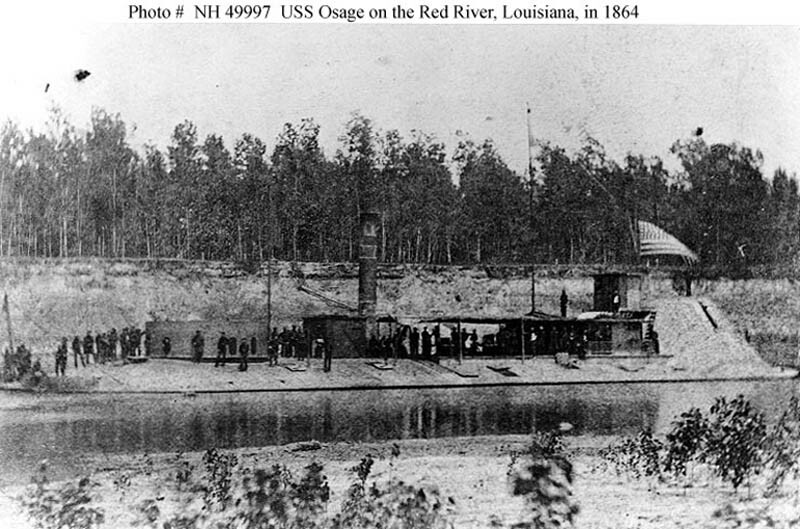 The first photo is identified as the USS Osage on Red River in 1864. This picture is from the US Naval Historical Center (NHC). Note the narrow river channel, high river bank with tree line in the background and weeds on mud flats in the foreground. The next photograph from the Special Collections Library at Duke University in North Carolina identifies the subject as USS Neosho. The ship in both photos is obviously the same however these are two different photographs. Notice the shape of the US flag. The photographer probably took multiple exposures while the crew patiently posed on the deck. Positively identifying the difference between the Neosho and the Osage is difficult since their appearance is very similar. Note the false gun ports painted on the side of the turret and what appears to be patches on the stack. Smokestacks of all the steamers of the fleet were vulnerable to small arms and artillery fire. An additional bit of evidence to support this photo as being Neosho is the presence of two deck guns on wheeled carriages amidships. In the statistical data volume of the ORN, the Neosho is recorded as having one heavy 12 pdr smooth bore and one 12 pdr rifle after March 7, 1864 just days before the Red River Campaign began. 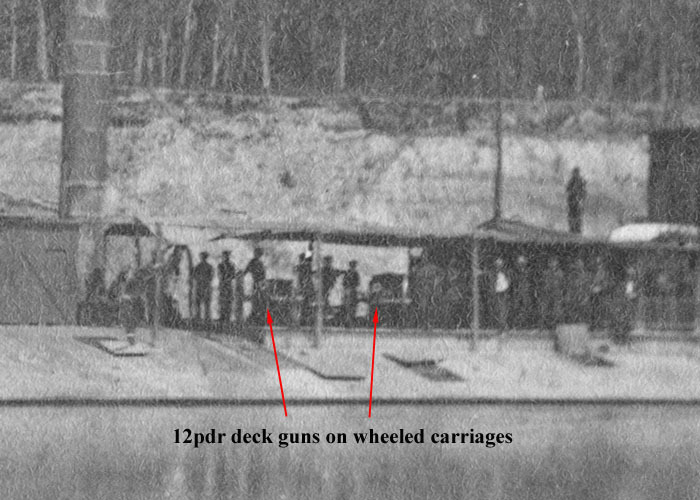 The following enlargement shows two deck guns posed with the crew. The Osage is recored as having one 12 pdr rifle after January 19, 1864. The following image is an enlargement of another photograph from Duke University. There is cotton stowed on the deck and a tarp spread over the deck just forward of the pilot house. 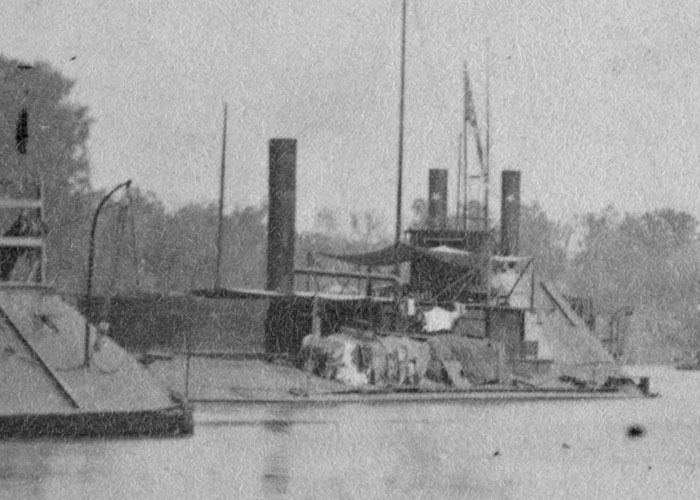 The stern of the city class gunboat Louisville is visible at far left and the two stacks of the city class gunboat Mound City are visible over the top of the pilot house. The Mound City had small stars attached to her smoke stacks. There are several details of this monitor that are different than the one in previous photos. 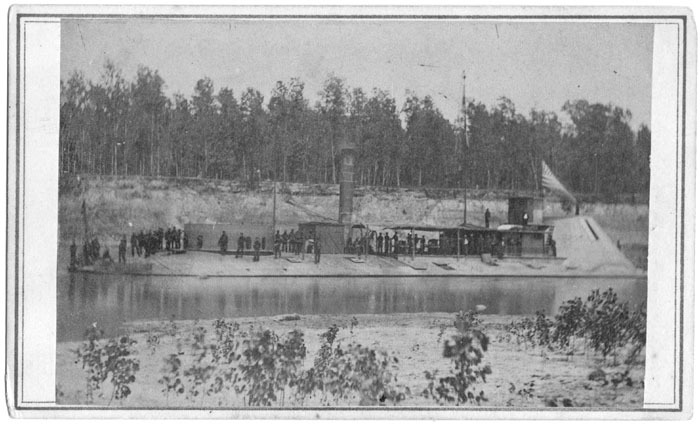 No false gun ports are visible, the flag appears much higher because the pole is taller, no patches are readily visible on the smokestack and there appears to be some sort of horizontal line just above the waterline and right below the cotton that runs most of the length of the hull. Notice in all the photos there is a thin vertical opening in the armored paddlewheel cover. In the previous photo there appears to be a corresponding light colored area just to the left of the vertical opening which could be a hinged cover or flap. It is not clear what purpose the opening served other than simply air circulation. It is possible that it could also be used for small arms fire from within but there would not have been enough room for an artillery piece since the paddlewheel inside occupied most of the space. Even if a small 12 or 6 pdr. could have been shoehorned inside there would have not been enough room for the recoil of the gun. The next photograph is from the book “The Photograhic History of the Civil War”. The photo is identified as being the USS Cincinnati. 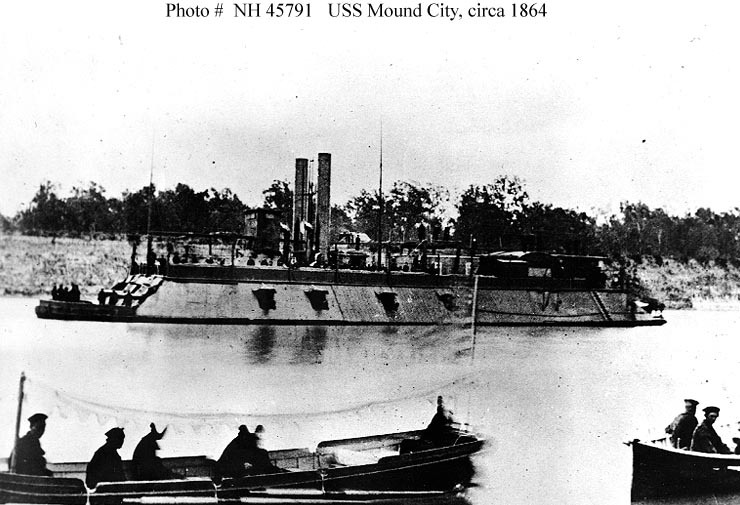 The Cincinnati was a city class gunboat and was sunk twice during the Civil War. It’s second sinking took place on the Mississippi River during the siege of Vicksburg in 1863. It was raised and repaired but was not with Porter on the Red River. 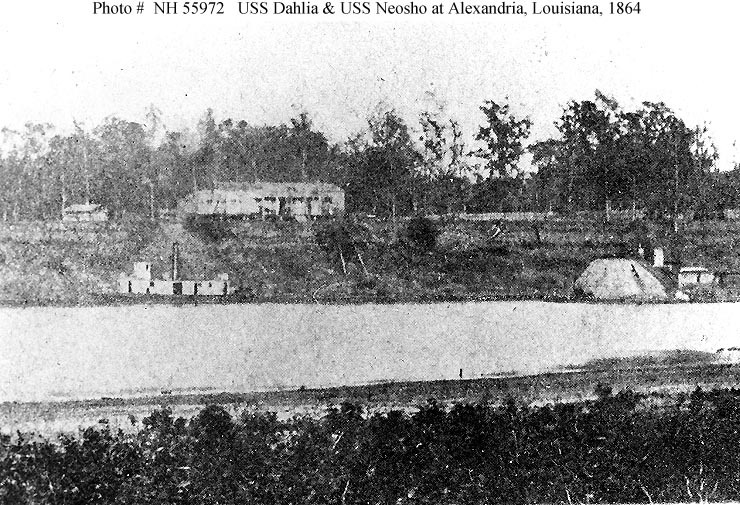 This photograph shows a very similar foreground and background as the Osage/Neosho photos. 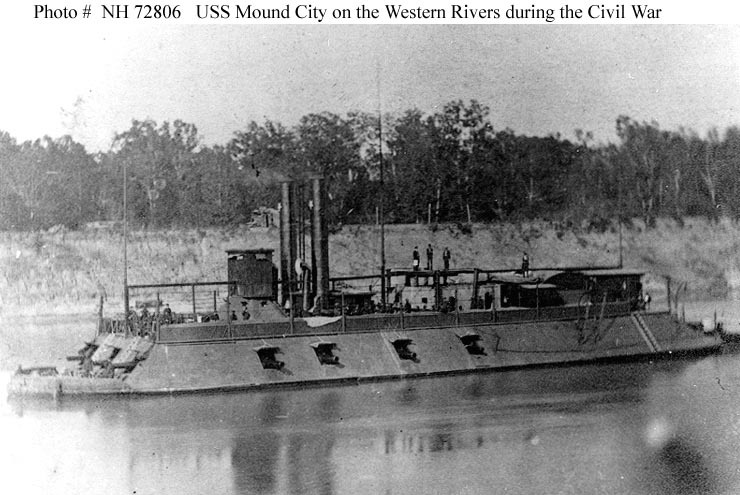 This probably the USS Louisiville on the Red River. 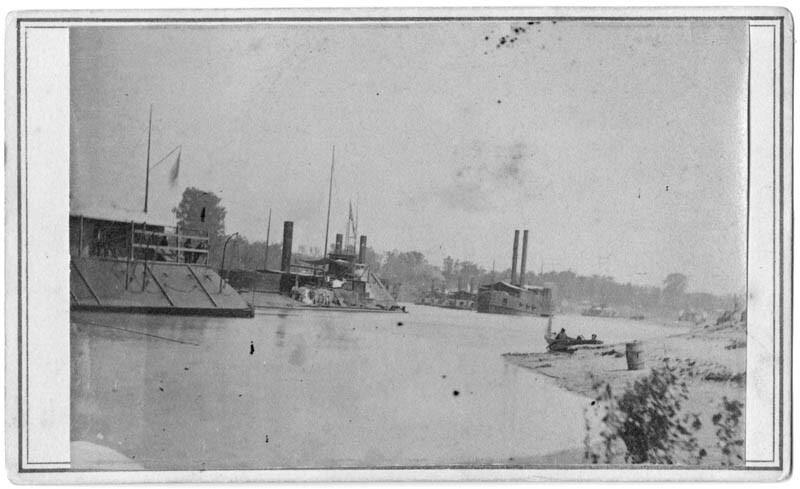 IOTR has recently obtained a carte de viste that apparently proves the identity of this ship as the Louisville on the Red River. 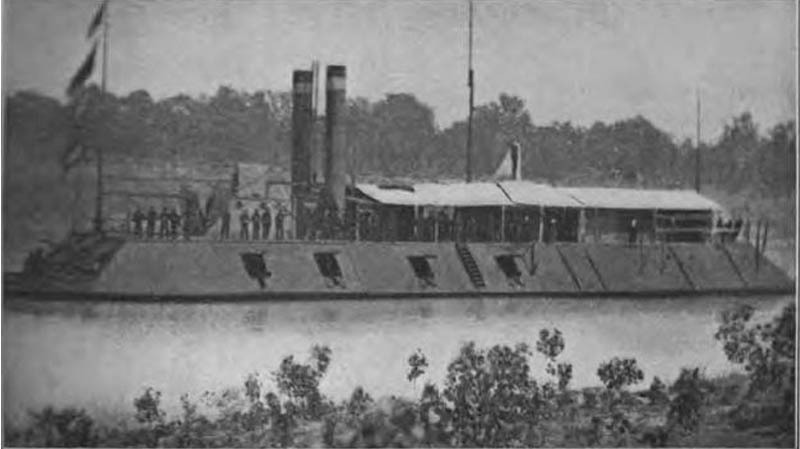 The city class gunboats with Porter on the Red River were Carondelet, Louisville, Pittsburgh and Mound City. Although the city class boats were very similar, there were also some differences between them. Of the seven boats of the class, some of them had 28’ tall smokestacks and some had taller 33’ stacks. At least two of the ships with the taller stacks were on the Red River in 1864. They were the Louisville and Mound City. The Carondelet had shorter 28’ stacks and it appears so did the Pittsburgh. The following two photographs are of the Mound City. When the city class boats were first constructed they had different color bands around the top of the smokestacks to identify them. At some point during the war, the Mound City acquired stars on the front of the stacks and a box shaped pilot house built on top of the existing armored pilot house. 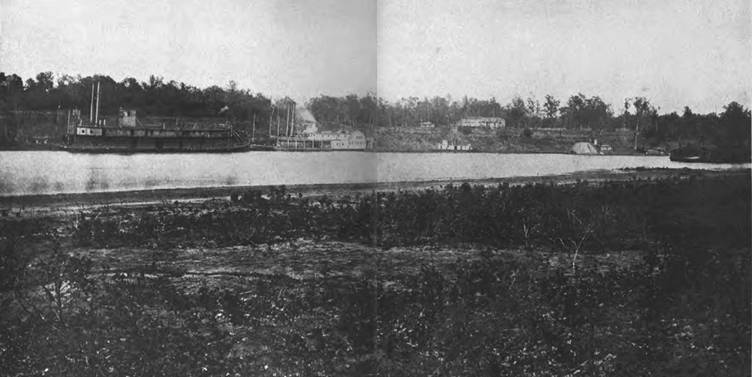 The next photograph shows several of Porter’s fleet lined up along the river bank with the Mound City in front. The stars are visible on the smokestacks. The next photograph is identified as the USS Pittsburgh. This ship appears to have the smaller 28’ stacks. The same river bank height, mud flats in the foreground and narrow channel appear as in several other photographs from the Red River. 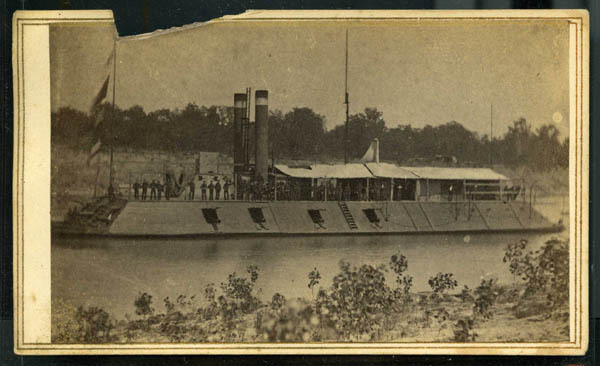 A photograph in the Special Collections Library at LSU identifies a different ship than the one pictured below as the Pittsburgh on the Red River so it is possible that this is actually the Carondelet. Here is another photograph from The Photographic History of the Civil War. From left to right: William H. Brown, Benefit, tug Dahlia, monitor Osage or Neosho and on the far right is the Chillicothe. This photograph, from the NHC appears to be a cropped version of the above photograph. 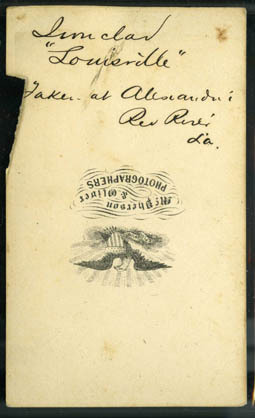 The original of the following photograph is in the Special Collections Library at Duke University in North Carolina. 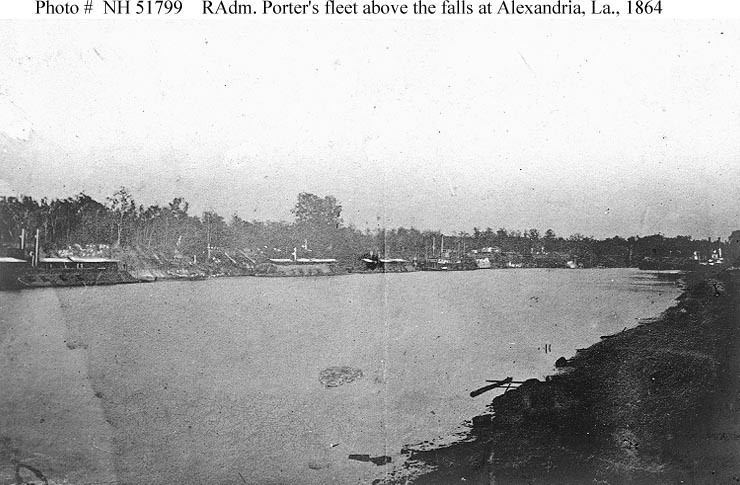 It shows several ships of Mississippi Squadron on the Red River above the falls at Alexandria, La. The city class gunboat on the far left is probably the Louisville. 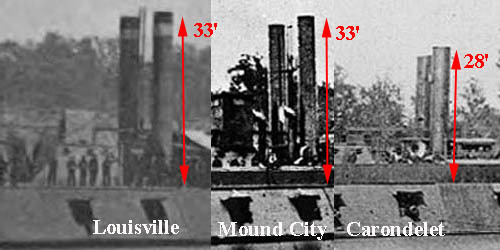 Notice the similarities to the earlier photograph of the Louisville. There is even a sailor leaning against the railing in the same location. The small air vents or portholes are also visible in both photos. The vertical lines on the casemate are skids for the small row boats carried on the sides. At some point before the ships passed over the falls, several of them had their side armor plates removed. However since the armor did not extend all the way to the back, it is not apparent if the armor has been removed or not.